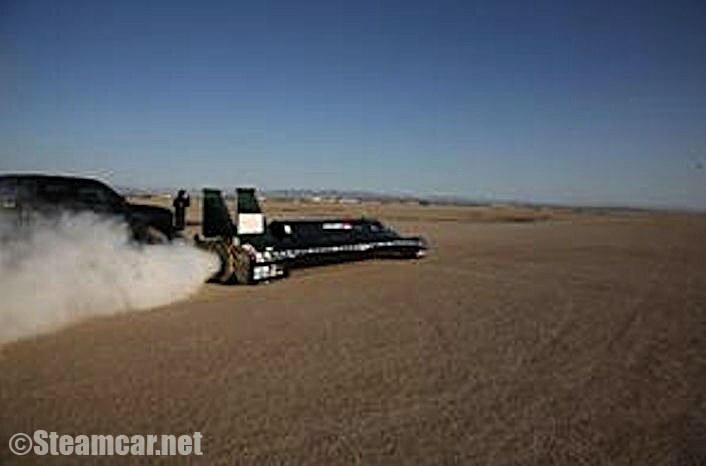 Yesterday at 8.22am (California time) Don Wales successfully set another land speed record for a steam powered car. 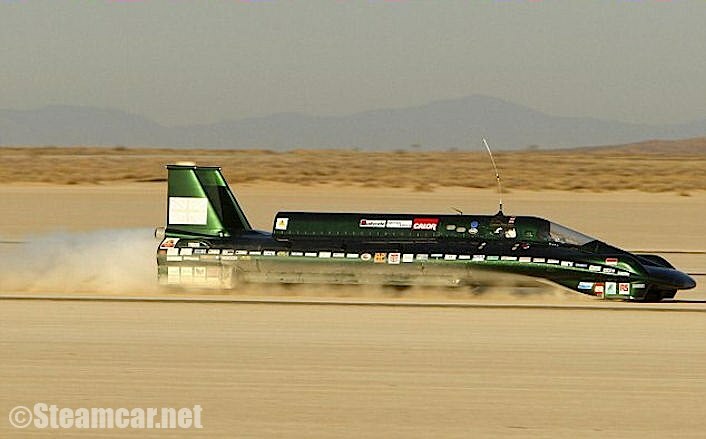 The car set the record for a measured kilometre – achieving an average speed of 148.166mph on two runs. After Charles Burnett III’s heroics on Tuesday in breaking the record for a measured mile, test driver Don Wales piloted the car for the attempt at the kilometre record and reached a peak speed over 155mph. Both new international records are subject to official confirmation by the FIA. The British Steam Car takes 2.5 miles to accelerate and after the measured km, a further 2.5 miles to decelerate – so each run was over 6.5 miles. The FIA requires that the return run takes place within 60 minutes. The times of the two runs are then averaged to obtain the official recorded speed. Compared to the testing we did in Britain, the British Steam Car ran 12 times the distance and twice the maximum speed ­– all within one hour. It’s been a huge challenge for all. Weighing three tons, the sleek 25-ft British Steam Car is made from a mixture of lightweight carbon-fibre composite and aluminium wrapped around a steel space frame chassis. It is fitted with 12 boilers containing nearly two miles of tubing. Demineralised water is pumped into the boilers at up to 50 litres a minute and the burners produce three megawatts of heat. Steam is superheated to 400 degrees Celsius which is injected into the turbine at more than twice the speed of sound. 1 - The International Record for a measured mile. 2 - The International Record for a measured kilometre. 3 - American National Record for a measured mile. 4 - American National Record for a measured kilometre. 5 - A Guinness World Record for a measured mile. Click here for BBC South video of earlier run. Click here for BBC South Interview. British Steam Car Team Diary Entry. Date: 25th August 2009 – Edwards Air Force Base, California. 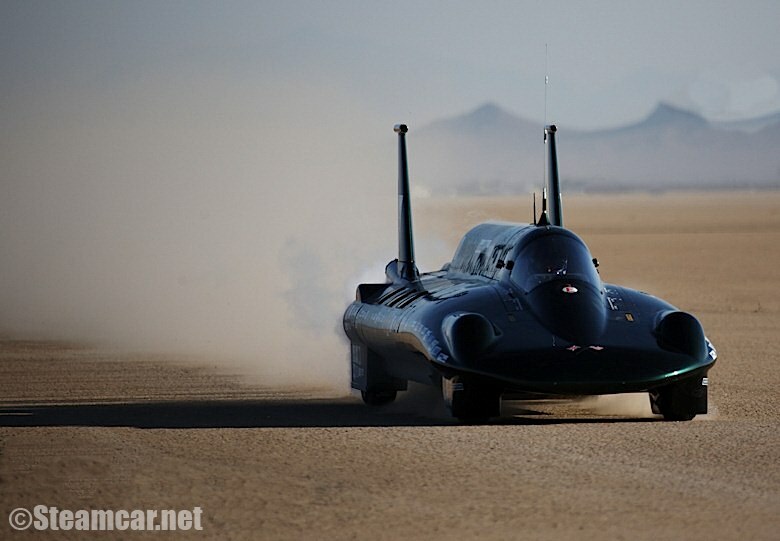 Today at 8.19am (California time) Charles Burnett III successfully broke the land speed record for a steam powered car – which has stood for more than 100 years – achieving an average speed of 139.843mph on two runs over a measured mile. Driver Charles Burnett III piloted the car for both runs reaching a peak speed of 136.103mph on the first run and 151.085 mph on the second. The new international record, which is subject to official confirmation by the FIA, breaks the previous official FIA record of 127mph set in 1906 by American, Fred Marriott, driving a Stanley steamer at Daytona Beach. 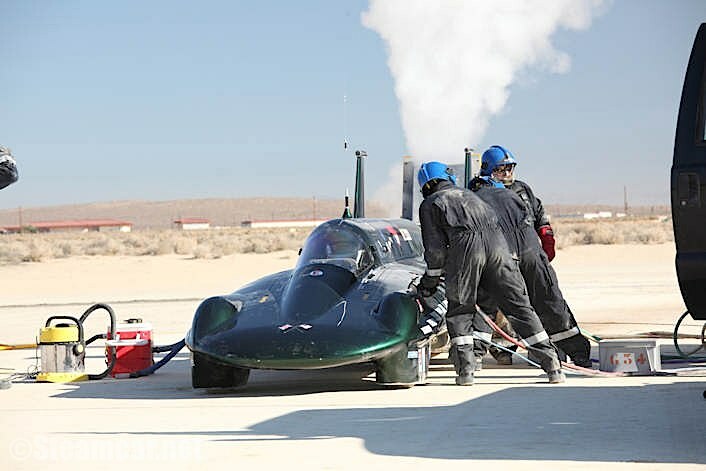 Project Manager Matt Candy said: "The first run took place at 7.27am when the air temperature was a cool 63 degrees Fahrenheit, the team turned around the car in 52minutes (with just 8 minutes spare) in preparation for its return run. The British Steam Car takes 2.5 miles to accelerate and after the measured mile, a further 2.5 miles to decelerate – so each run was over 6.5 miles. The FIA requires that the return run takes place within 60 minutes. The times of the two runs are then averaged to obtain the official recorded speed. Compared to the testing we did in Britain, the British Steam Car ran 12 times the distance and twice the maximum speed ­– all within one hour. It’s been a huge challenge for all. Pam Swanston wife of the late project manager Frank Swanston was overcome with emotion after seeing Charles power the supercar across the dry lake bed, she said: "If only Frank was here today, it was his vision that made it a reality. He would be incredibly proud of the team's achievements and always believed we would succeed. Today we celebrate this record for Frank"
From: Don Wales. - Test Driver. At last we have a record (subject FIA ratification). The day started as normal with the 4.30am alarm call and everyone slowly congregated in the hotel foyer drinking coffee and juice. There was the usual banter between us and everyone seemed to be confident, It had to be today. The car was given a good clean yesterday and owed us a good run! At Edwards we all got ready to enter the lakebed. I was taking the turnaround refuelling rig to the far end, where we waited for the car to arrive. One of my tasks was to operate the airjacks from the laptop, but I could see that the car and computer were not talking to each other. So we wasted a few minutes, because the car controller had shut down. Once up on its Jacks the team performed a slick turnaround. The outward run was approx 132mph. The fill process seemed to take an age, we were informed that we had 7 minutes of time left, but the car was still filling! Once released The car accelerated away very well indeed and reached the other end in good time at an average of approx 147mph with a peak speed of 151mph. The average for the two runs was 139mph! The turnaround team were jumping up and down, hugging each other. Knowing that we had broken the record was a great release for all of us. All the hard work and ups and downs (mainly downs!) had paid off. The team had overcome huge obstacles to achieve this record. Its been harder (both physically and mentally) than most of us thought. 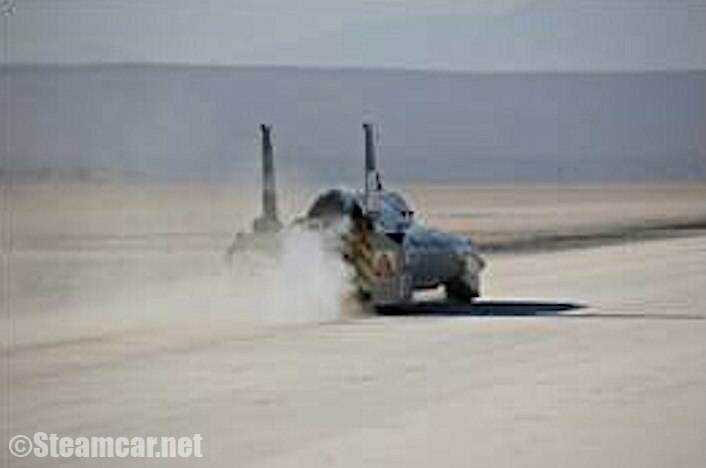 The drive down the runway was interesting because the USAF were doing some low level high speed fly pasts. We had to time our drive between each sortie and looking out for fast jets flying very close, our own private air display! Tomorrow Charles has given the keys back to me and we are going for whatever the car is prepared to give us, hopefully an average of 150mph would be good! This might be the last time that the car is ever driven, so hopefully it will be nice to me with a couple of fast passes! Date: 24th August 2009 – Edwards Air Force Base, California. British Steam Car Team on Course for World Record Success! The weather was stormy, and noticeably cooler. The team worked in earnest to rectify the electrical fault, but the part arrived two hours late. The team carried out a static test, which was the best they have ever had with steam temperature running at 380degrees, demonstrating that the car now has more power. Typically on a 130mph run it is operating between 300-320, so this was good news. However the static test detected a fault with the water bladder, which had been damaged by the flow of pressure being pushed through the flowmisers. There was little more that the team could do, time was ticking on, so it was decided that they would carry out the bladder repair (which typically take 2-3hours) on Monday. They would utilise this time to carry out maintenance, such as flushing through the flowmisers and mechanically setting them, and clearing the car of any contaminated water. The next run will be Tuesday. Click here for BBC South film of early run. Date: 21st August 2009 – Edwards Air Force Base, California. We arrived on the lakebed full of anticipation and optimism. The air was still, it was a beautiful sunrise and we were all on schedule. The first run peaked at 133.491 but picked up speed when exiting the measured mile. The measured mile was 128.628. The turnaround crew was on target at approximately 40 minutes in preparation for its return run. Whilst the car was being refilled there was pressure problem with the water rigs. The second run was aborted and we all returned to base. The temperature soared to over 104f, and over 40% humidity. Having tracked down the route of the problem to a minor electrical fault, the team continued to work and source spares to rectify it. Clouds began to roll in, a storm kicked up with over over 45-50 mph gusts, we had had to rescue the marquee as things began to fly away. It became impractical and dangerous to work, the team battened down the hatches and called it a day. The weather forecast has predicted bad storms and lightening. It is really howling out there! The team will continue to work on the car tomorrow (Saturday) and carry out a static test for more runs on Monday, when I will bring you more news. Date: 20th August 2009 – Edwards Air Force Base, California. Yet another bad day for Steam Car Record Breaking at Edwards! The temperature is slowly creeping up and is forecast to be very hot again tomorrow and Friday with thunderstorms on Saturday. I had another go with the BBC camera at the turnaround end. This time I managed to get the right pics, second time around! It was really interesting to view things from outside the cockpit, which I normally do not see. However, I could tell that the outward run was not very quick through the viewfinder. This time we had Clive's team as the turnaround team and it was a very slick operation, but the car took an age to fill. It was a close call to get the car away within the hour. I know that record breaking is not easy, but this car is making us all work very hard for it. I am beginning to think that maybe it should repainted a certain blue colour. Campbells don't like the colour green!! Tomorrow is another day and I will watch the attempt from the base camp on top of the portacabin where you can view the whole course in the distance! We need a good day with a speed of 140mph plus, wish us luck! The team made the first official attempt at the world record today, but decided to abort the second run after a slight problem with the throttle was detected. It is understood that the throttle was letting water through the turbine rather than bypassing it. The team will investigate the problem this afternoon with the intention of attempting the record again tomorrow morning. Date: 18th August 2009 – Edwards Air Force Base, California. The British Steam Car Team has now successfully carried out 5 test runs in excess of 100mph ahead of its bid to break the century-old world land speed record for steam-powered vehicles. After numerous setbacks last week, the team were jubilant on Saturday having unofficially beaten the Fred Marriott record. The teams own calibrated equipment measured the two way average at 137.14mph, and a 48min 52 second turn-around. Tomorrow the British Steam Car Team will commence their attempts to achieve an official record The current FIA record is 127mph previously set by American, Fred Marriott, driving a Stanley steam car in 1906. Project Manager Matt Candy said:" it was an enormous achievement on Saturday and one we hope to replicate now that the FIA timing officials have joined us today. The timing equipment is currently being set up cross the 6mile lake bed. When we left England we knew we had a tough challenge ahead, but we had carried out all the testing we could. 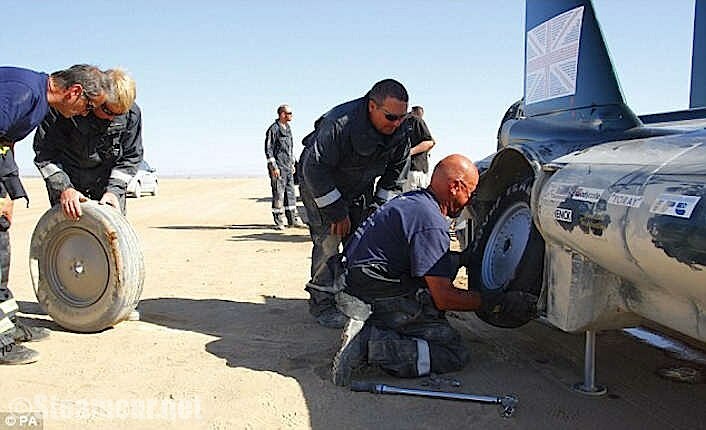 Since arriving in the U.S.A. the team has had to do a lot of preparations to, Portsmouth, the goal has been to make the car travel twelve times the distance, at double the the car with the effects of heat, altitude and the surface conditions. Compared to UK testing at Thorneyspeed and twice in within one hour. Saturday was a milestone for the team in achieving this goal". The FIA is the sanctioning body and now recognizes a land speed record as the average speed of two passes made across the same measured distance in opposing directions within 60 minutes of each other. The time of the two runs is then averaged to obtain the official recorded speed. The record runs will commence at 6am (USA time). We will keep you posted with the team news! Principle Driver Charles Burnett III was born in England in 1956 and educated in South Africa and America. As a legitimate tri-national - his mother was Canadian and his father American - he inherited a love for travel and all things mechanical from his father, who raced hydroplanes and restored Hudson automobiles. A long-time powerboat enthusiast, Charles set up Vulture Ventures, a UK-based offshore racing team, which soon became known as the world’s most successful team in the sport. During this time, Charles took a variety of world records using catamarans and monohulls powered by diesel, petrol and LPG. He was included in the Guinness Book of World Records in 1999 for an offshore water speed record of 137mph. The team acknowledges the achievements of the "Barber-Nichols Team". Their vehicle 'Steaming' Demon' is currently the fastest steam car in the world. On 18th August 1985 The Barber-Nichols Team carried out three successful passes and achieved an American National Record at 145.607mph. There was no attempt to establish an FIA record. However, the British Steam Car Challenge recognize this speed as the record to exceed. Date: 17th August 2009 – Edwards Air Force Base, California. Test Run Today 148 mph. Don arrives with us tonight, therefore in the meantime I wanted to give you a quick update of the team news today. Its my first day at Edwards and I can see how incredibly hard it must be for the team to work in such extreme heat. We arrived at the base at 5.00am, the security check process went smoothly and drove the 12miles to where we are stationed on the lakebed just as the sun rose. It was beautiful. It was a chilly start, but soon heated up to 104f and at first even the car was cold and the gas wouldn't fill up. Around 7am it was all systems go, Charles made his first run reaching 148mph. The crew turned her around in less than 50minutes (they have it to a fine art). During the second pass Charles had to stop as one of the 130 sensors had shut the system down as a safety precaution. The sensor turned out to be faulty and has since been replaced. No big issue. The team also replaced a flowmiser, as it was stuck open and throwing wet steam in to the dry steam affecting the cars speed and performance. The FIA have just joined us, and will be setting up the course tomorrow. Attempts will commence on Wednesday. Ironically the date co-incides with both the Barber Nicholls run and when Don Wales achieved his Electric record. No pressure! In the meantime the course is undergoing further "fodding" - 1 extra mile (7 miles in total). The car is peaking at 3.8miles, and as are probably aware a land speed record is on a measured mile, 2-way pass with 1hr turn-around. At the moment the car is peaking slightly late, so this should balance it out. The speeds they are achieving are certainly record breaking, so now we just need the timings guys all set up and plenty of luck on our side. Please support our boys they really are doing a grand job. Date: 7th August 2009 – Edwards Air Force Base, California. From: Don Wales – Test Driver. Test Run Today 131 mph. 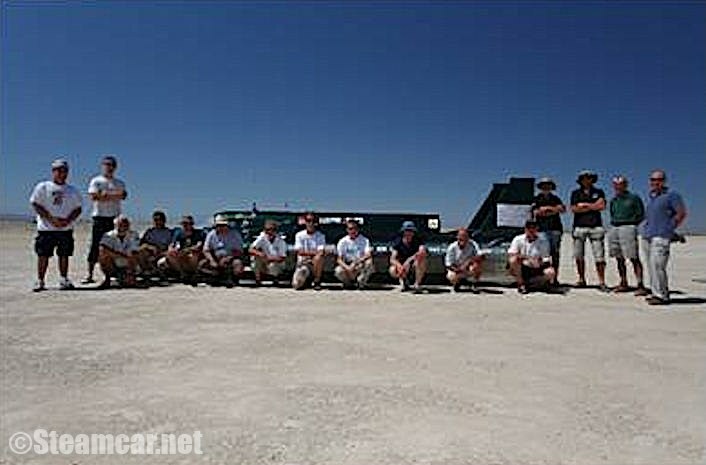 The British Steam Car Team carried out another successful test today, and reached speeds of 131mph. This is faster than the current world record, however as the FIA was not present, it is not officially recognized. The FIA will set up the course on Monday 17th August and record attempts will be made on the mornings (~6.30 am to 10.30am USA time) from 18th August to 22nd August. After numerous technical problems reported, the British Steam Car Team has carried out four successful runs ahead of its bid to break the century-old world land speed record for steam-powered vehicles. 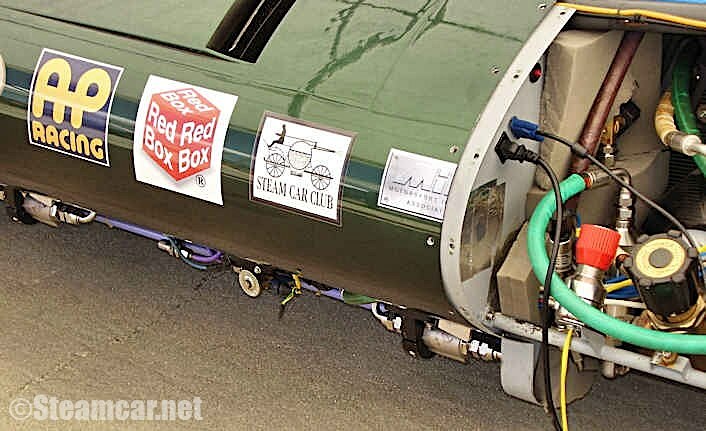 The 25ft-long British Steam Car dubbed “the fastest kettle in the world” reached speeds of over 131mph at Edward’s Air Force Base, California today. This is faster than the current world record. However as the FIA was not present, it is not officially recognized. The FIA will set up the course on Monday 17th August and official record attempts will be made on the mornings (~6.30 am to 10.30am USA time) from 18th August to 22nd August. We had two good days of testing and after the mid week depression to finish the week on such a high was exactly what we all needed. It was evident that all the hard work and team drills had paid off. The car was set up on the lakebed in a bitterly cold wind; we were all glad of our protective suits today, which normally we boil in! I was strapped in as usual, Jerry told me that I should be prepared to lift off at about 120 - 125mph but if it felt ok I could carry on. The car was ready and I sent off without delay. The car had 2 minutes of burn time and we were using 3 1/2 miles of track. The boilers were still to run a bit cold at about 270 degrees c rather than the available 400 degrees c. It was our best run to date, I lifted off momentarily at 125 mph but everything was running good so I put my foot back down. The car touched 131mph and I then started to slow down, as tyre pressure light had come on. We had gone faster than the official world record of 127mph, but we still have a lot to do. We need to maintain the speed over a measured mile, accelerate quicker, and do a return run within an hour. We know that the car has the potential. We went out and celebrated, which is why today's entry is a little late! I flew home on Saturday and was looking forward to seeing the wife and kids; it's been over 4 weeks. I will fly back on the 17th August in preparation for the timekeepers. Charles has agreed that I will have the opportunity to try for the Kilometre record, which is great news as a test driver. In the meantime Charles's has taken over at the helm and this week will be familiarising himself with both track and the car. The team will also be carrying out more improvements. My blogs will stop momentarily and start again when I return. Date: 6th August 2009 – Edwards Air Force Base, California. I am pleased to report that the car ran beautifully this morning. We have been carrying out low speed tests to check Jerry's software modifications and today were one of the last ones. We tested the slam acceleration which still needs a little more “tweaking”, but reached in excess of 95mph again with just 90 second burn time. Tomorrow we are upping the burn time to 2 minutes so we should exceed 100mph and use approximately half of the track that we will have available come attempt time. No matter how hard I try to avoid getting into trouble out here, I fail. I was told off for speeding again by the Lakebed Management Team that patrols the lakebed! Having just carried out our 95mph steam car run, Charles suggested we take his new Dodge Viper for a high speed test of the prepared course. Naturally I obliged, but did warn him that it will get covered in lakebed dust both inside and out. We obtained clearance for a high speed run to test the track. So into the driving seat and off we went! That car is certainly mean in second gear, but great fun snaking away. The first run was 140mph, second run was 160mph. One of our guards joined me for a passenger ride as I reached 185mph. Adam also jumped in for a quick short burst sideways. It was awesome. When we got back to South Base the Lakebed Management Team was having a word with Matt about speeding on the lakebed, even though we had permission. I consider myself told off. Boys and there toys hey! Date: 5th August 2009 – Edwards Air Force Base, California. Today had to be the worst day for the team’s morale as we had high expectations of a good run. There was a huge full moon setting over the lakebed as we arrived. I was strapped in to the car and waited for it fire up, which she did with a sense of purpose, but I could feel and see the burners cutting in and out intermittently. We had a blocked miser, which hasn’t happened since Thorney Island. After carrying out several successful runs, it was hugely disappointing for us all. I went into chef mode cooking breakfast and washing up whilst the team worked intensively on the car. We then had another issue to contend with, battling a very strong and hot wind. We took down all the tents to save them from being blown away; the mechanics were working without shade or shelter, which was a thoroughly unpleasant experience. It was a tough day. The car is now ready for the attempt during the week of the 15th. Test run made before 9.30am 31st July. US time. Date: 4th August 2009 – Edwards Air Force Base, California. Today was cloudy and only in the late 80's which is over 20 degrees cooler than the past few weeks. It took the customary 1 1/2 hours to get our weekly passes on to the base and through the security process. We had a good static test with the turbine running whilst the back of the car was raised on its air jacks; it was then slowly dropped back down as a slam test to help improve acceleration. We are currently down to only half of the crew numbers, as some of the team returned home for a well deserved break. But we have enough to run the car on one way passes and continue the testing. I return home at the weekend and return with fellow team members on the 15th August in preparation for the arrival of the FIA and timed runs! Sadly, Lynne, Wilbur and Stuart have other commitments and are unable to return – they will be really missed.